Halo: Outpost Discovery is an interactive experience developed by 343 Industries, designed to allow Halo fans to experience the Halo universe in a number of unique ways, including a museum, theatres, VR, gameplay and more. The experience is currently set to tour several locations in North America through the summer of 2019. 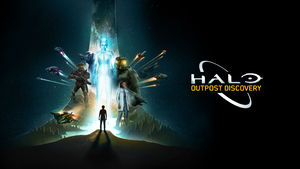 Halo: Outpost Discovery is framed through the in-universe "Outpost Discovery", an event hosted by the post-war UNSC to encourage civilians on Earth to learn about humanity and the galaxy at large. Players are able to interact with two SPARTAN-III characters, Owen-B096 and Hazel-A302. Art depicting Owen-B096 and Hazel-A302.